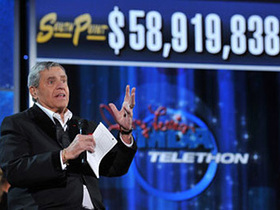 After 21 ½ hours of great entertainment and powerful appeals, the final timpani rolled and confetti fell on the 2010 Jerry Lewis MDA Telethon which raised $58,919,838 in contributions and pledges to advance the research and service programs of the Muscular Dystrophy Association. 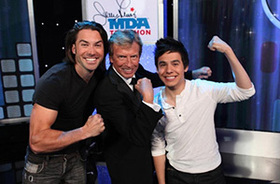 The Telethon originated for the fifth year from the South Point Hotel in Las Vegas, reaching some 40 million viewers by way of MDA’s Telethon network of some 170 television stations, as well as cable throughout the United States and Canada. Millions more around the world saw the Telethon at www.mda.org courtesy of RealNetworks. “For the first time ever, the Telethon opened with the stage set for one child, MDA National Goodwill Ambassador Abbey Umali,” said Gerald C. Weinberg, MDA president & CEO and Telethon executive producer. After 11-year-old Umali said “now on with the show,” the stage was immediately filled with tap dancers choreographed by Tyce Diorio – followed by a host of performers including Barry Manilow, David Archuleta, Enrique Iglesias, Michael Feinstein, Maureen McGovern, John Ondrasik of Five For Fighting, and Charo; groups Lynyrd Skynyrd, WAR, OneRepublic and The Oak Ridge Boys; Las Vegas productions “Viva Elvis by Cirque du Soleil,” “Jersey Boys” and “Vegas! The Show”; Broadway segments from “Memphis,” “Rock of Ages” and “Million Dollar Quartet”; and the cast of the television show “Glee,” as well as a host of others. Telethon co-hosts included Alison Sweeney, Nancy O'Dell and Jann Carl – as well as special guest co-hosts Nigel Lythgoe, Richard Belzer, Ace Young, Brandon Barash, John Pinette and Billy Gilman. Comedic performers included Carrot Top, John Pinette, Norm Crosby, and Bob Zany. The third annual Telethon Online Auction, held in conjunction with the broadcast and hosted by Brandon Barash, continues through Sept. 15 at www.mda.org/auctions. It features hundreds of unique items. MDA’s Augie’s Quest research initiative also raised more than $4.1 million to speed worldwide ALS research. Last year, the Telethon total was $60,481,231.